A refreshing hostel ... a really great spot in the center of everything with fab prices. Our staff have compiled an extensive list of Things to do from day tours to restaurants and nightlife. Please ask us for any information that you may need to make your stay in Killarney as pleasurable as possible. There are so many things to see, to do, to explore, to experience on the Dingle Peninsula . . . from almost 2,000 archaeological sites, to more walking than you could fit into a year. The Ring of Kerry is part of the mystical & unspoilt region of Ireland that has attracted visitors for hundreds of years. Its spectacular beauty is beyond question and it is a natural centre for outdoor pursuits including golf, watersports, cycling, walking, riding and the very best fishing for salmon & trout. 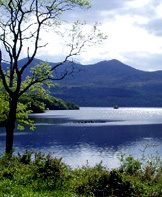 Guided walks of Killarney National Park and surrounds. Standing at 1,039 metres, Carrantuohill, part of the Macgillycuddy’s Reeks, is the highest mountain in Ireland, with a number of good ridges, just lower than Snowdon, but higher than anything in England. Killarney has a wide variety of fishing opportunity’s for wild salmon, brown trout and sea trout. Killarney has a wide variety of golfing possibilities. This Castle may be considered a typical example of the stronghold of an Irish Chieftain during the Middle Ages. The date of its foundation is uncertain but it was probably built in the late 15th century by one of the O’Donoghue Ross chieftains. As well as being a unique UNESCO World Heritage Site, experience the wonderful STAR WARS movie connection. May the Force be with you!! Over 1,100 acres of unspoilt largely mountainous terrain, the Great Blasket Island is approximately 4 miles long by 1/2 a mile wide. The old village above the Trá Bán (White Strand) is situated on the north-eastern side of the island, facing the mainland and Slea Head.